Finally! Photographic proof that it was Century Cycles' BEST EVER Pajama Party Night Ride on May 19! Check out the album below with tons of great photos taken by our own Doug Charnock of some of the 250+ pajama-clad people who joined us -- and huge thanks if YOU were one of them! Many thanks, too, to Bike Cleveland for joining the party to sign people up as members (join them if you haven't -- BC is doing GREAT things for cycling in NEO! ), Grunt Girl Racing for collecting everyone's wonderful donations to (and making us all more aware of) Project Night Night, and the always-accomodating Winking Lizard in Peninsula for letting us storm their tasty beer supplies post-ride. 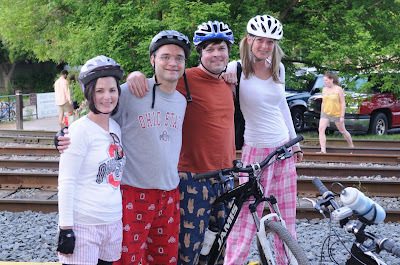 Please share any great pajama-riffic photos you may have in the comments or on our Facebook wall, and see you June 23 for our next Night Ride!